The opening scene of Raymond Chandler’s story Trouble is My Business tells you a lot in a very few words about Chandler’s “private eye,” Phillip Marlowe. Marlow is talking to a woman who runs a detective agency, a big one with several agents. But none of her people is suitable for the job she has. She wants to hire Marlow for this one case. During their edgy conversation, she says something about a previous case of Marlowe’s, and he takes umbrage. I started to get up out of my chair, then remembered that business had been bad for a month and that I needed the money. “I gotta make a little something for myself,” Anna whined. Just who is the private detective of this “hard-boiled” fiction genre? — He’s male and middle-aged and has a history. — He’s alone. Whatever wife or family he’s had are long gone, a distant memory, maybe part of the history. — He drinks, but not to excess. — He’s cynical, and one thing he’s good at is spotting people’s real motives. In his experience, people are rarely truthful about what they want or how they feel. — He likes women, particularly good-looking dames, but he keeps his distance, if not physically then emotionally. — You can count on him to do what he says he’s going to do — usually. — He lives by a code. His ethics may not conform exactly with yours or mine, but they’re there, and they govern his behavior. 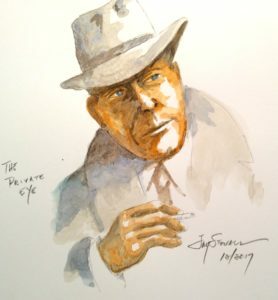 In the years since Phillip Marlowe (Chandler) and Sam Spade (Hammett) came onto the scene, there have been many versions of this character. Sometimes they’re not male. Sometimes they’re not private detectives. Sometimes they are happily or unhappily married. The iterations go on and on. Next: It began with Dashiell Hammett. Jim, thanks for all the writing you do and are doing. You authors are a ‘Special breed’. because I purchased or received the wrong genre. Right now I have too many books to read, but am hoping to get the ones I have finished, Before I get any more. Thanks, Art. I really appreciate your comments and thoughts. All the best, Jim.